and by Phil Collins in In The Air Tonight). The entire concept album divided in four different sections is composed, arranged and performed by Francesco Gazzara as if the electronic sounds palette would be an entire symphonic orchestra in his hands. There’s also a cinematographic reference – as Gazzara himself is a TV and cinema composer since the late ‘90’s – to the experimental electronic soundtracks written by John Carpenter for his own movies, especially in the opening track “Prologue 2084”. 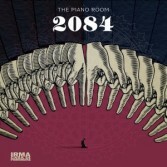 At last, being this a The Piano Room release, 2084 includes also three bonus tracks for solo acoustic piano, in tradition with the project’s earlier albums Early Morning and Breath, Feel.